These padded covers are made from heavy nylon cordura. The navy blue is accented with colorful embroidered croquet logo. It features an adjustable carrying sling. Inside the zippered head section is a clear pocket for keeping your official rulebook. An outside clear window allows for a name tag for plane travel. The regular size cover fits all mallet heads up to 10" long. 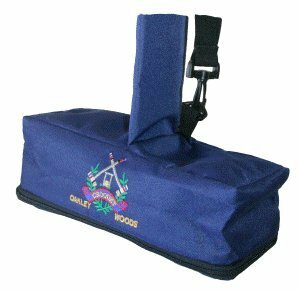 See The Croquet Store for a large size cover to fit mallets with heads up to 12"
If you have any questions about this product by Oakley Woods Croquet, contact us by completing and submitting the form below. If you are looking for a specif part number, please include it with your message.